Description: Sheet and filigree wire disc pendant made from pale gold. Circular sheet with a border of applied beaded wire around the edge, now broken in several places and with a short length missing. 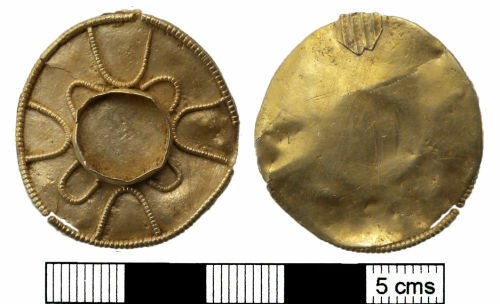 There is a large central circular setting, now empty, made from an upright strip of gold which has been very neatly soldered to the circular backplate. From this extend four small, evenly spaced U-shaped pieces of beaded wire, alternating with four large U-shaped pieces of beaded wire which extend from the outer edge of the pendant to the edge of the central setting, thus creating a cruciform motif. Only a fragment of the ribbed gold sheet suspension loop survives, soldered onto the otherwise plain reverse of the sheet disc. The surviving fragment of suspension loop is 6mm wide; it has four ridges and five grooves running along its length, and is cut to a double point. The suspension loop is on the reverse of one of the larger U shapes. The beaded wire has been made using a swage (a grooved tool which is rolled over the wire), leaving a clear medial seam (or Äquatorschnitt) on most of the beads; this central groove has worn away on the upper edge, but wear on the filigree in general is not heavy. In two places, on one of the small and one of the large U shapes, one end of the wire has not been beaded, and on the small U there is what appears to be the start of a loose spiral groove, perhaps showing that the wire has been made by block-twisting (Whitfield 1990, 14-18). The diameter of the wire on the outer border is 1.0mm, and that on the U shapes is in general a maximum of 0.86mm. Dimensions: Diameter 30mm from missing loop downwards, 28mm from side to side. Weight 3.7g. Discussion: Gold filigree-decorated disc pendants are a well known but not common seventh-century type. Parallels on the PAS database include ESS-7E4F06, ESS-450B96, SF-B6EFA1 and NLM5404; excavated examples include several from Lechlade (graves 84, 95 and 179) and a remarkable set from Boss Hall 93 (Scull 2009, 17-18, 43, 99-101). There is considerable variation between different filigree pendants, but some similarities including U-shaped cross-elements, can be found between NMS-515C15, SF-B6EFA1, the Boss Hall group, and two of three, perhaps from a single grave, found at Milton Regis in Kent (Webster and Backhouse 1991, 36a and c). Date: Many of the grave finds of gold filigree pendants are associated with other objects suggesting a date in the second half of the 7th century AD (Geake 1997, 38).